Immerse yourself in a true beachfront resort where the party never stops at Sandals Montego Bay, located in sunny Jamaica! At this flagship, true original Sandals resort, you’ll discover a Love Nest Suite so perfect for honeymooners that we just had to name it after one of history’s most famous love stories. So grab your Romeo or Juliet and get to know this playful and romantic Caribbean resort’s incredible beachfront room dedicated to romance. Sandals Montego Bay is where the world first fell in love with Sandals. Experience the casual island vibe of this spectacular resort from the comfort of your beachfront villa, complete with an outdoor Tranquility Soaking Tub for two, a bistro set for beachside relaxation or al fresco dining and your very own personal butler to fulfill your every whim! 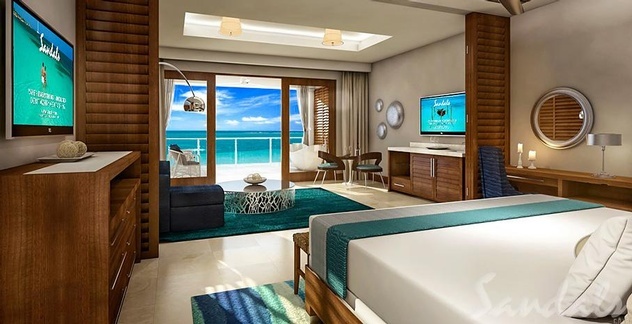 This extravagant Love Nest Suite is newly built and located directly on one of Jamaica’s best private, white-sand beaches, fully equipped with a master bedroom featuring a king-size bed and a separate living room boasting elegant furnishings and a fully stocked wet bar. Plus, you’ll enjoy a lavish spa-style bathroom featuring a dual-control, walk-in overhead rain shower, twin vessel sinks and large back-lit mirrors. Then, when the sun sets, make your way out to your expansive private patio and enjoy a romantic candlelight dinner or delight your taste buds at one of the resort’s 9 restaurants. Better yet, you can feast at up to 20 different restaurants with our amazing value Stay at One, Play at Three resort exchange privilege between all Sandals resorts in the Montego Bay area! Planning a WeddingMoon or romantic getaway? Contact me for availability and pricing of this featured Love Nest Suite of the Month.